Blog — Artists Open Studio, Inc. 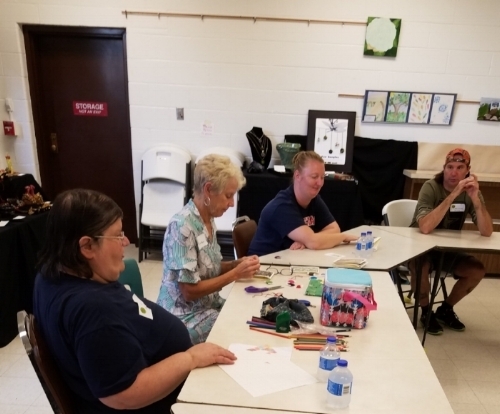 Accessible Expressions Ohio 2019 – 4 AOS Artists Represented and 1 Big Surprise! 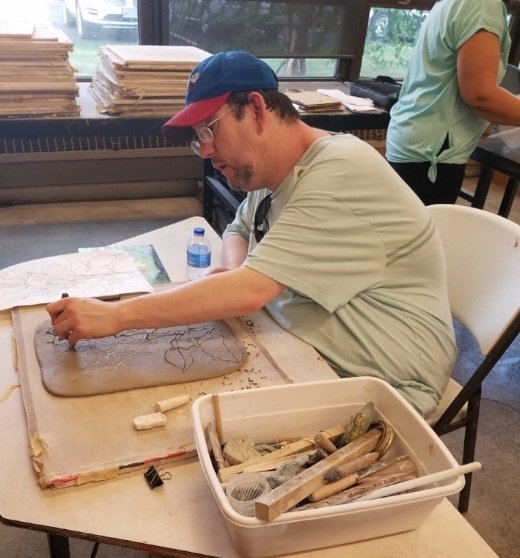 VSA Ohio- The State Organization on Arts and Disability, hosts Accessible Expressions Ohio (AEO): an annual art exhibit open to artists of any age and experience level with a disability in the state. AEO increases awareness, promotes creative careers, and fosters inclusion by showcasing artists of all ages and abilities in a juried, traveling exhibition. Historically, this annual exhibit has been a larger platform for AOS artists to have their work seen and appreciated by art lovers throughout the whole state of Ohio. This year, 4 AOS artists were accepted into the 23rd Accessible Expressions Exhibit. These artists include Andy Kirkpatrick (Receding Green- acrylic), James O’Dor (Night Owls- Stoneware and Glass Mosaic), Barb Seevers (Three Wisemen- colored pencil), and Sarah Vanderpool (Balanced- Stoneware). Andy Kirkpatrick’s Receding Green on display. Sarah’s artwork on display at VSA! On Saturday, March 30th, A Day of Arts for All was held at the Westerville Community Center in Columbus to celebrate the achievements of each artist. Artists Barb Seevers and James O’Dor were present to enjoy the exhibit, meet fellow artists, and receive their certificates of achievement. The best surprise of the day was James O’Dor receiving 3rd place in the professional artist category for his mosaic Owl piece! James was present to receive a much deserved medal of recognition and applause from the crowd! Congratulations to James for an amazing achievement and to Barb, Andy, and Sarah! Barb and James posing at the end of the reception. James showing off his medal! JOE CONWAY has joined us in AOS Painting Studio to add a lot of fun to our meetings. Behind his soft-spoken demeanor, he has a great sense of humor and an amazing ability to make these fantastic renditions of his favorite comic heroes drawn larger than life in colored pencil. We look forward to more of Joe’s work this year. 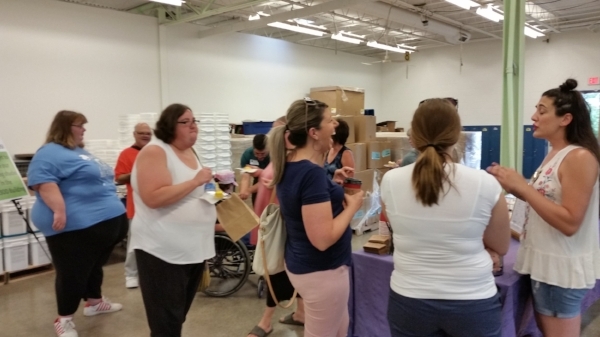 On Thursday, August 9th, AOS hosted a special Open House event for the public. The evening was a first time event for Artists' Open Studio. Guests were able to explore the painting studio housed in the Huron County Board of DD. 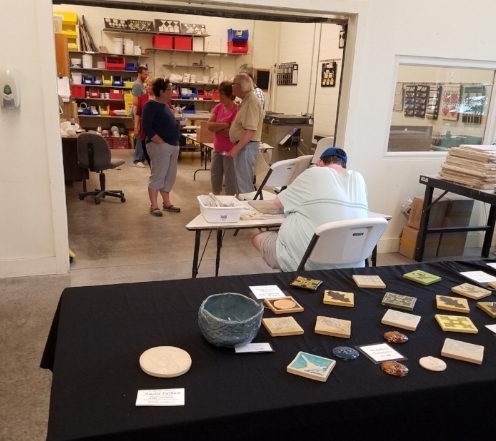 Across the parking lot at CLI, guests viewed tile demonstrations and artists at work in the clay studio. The Open House event was intended to educate the community on the mission of AOS, as well as to raise funds to become self sustaining and continue growth in the future. AOS artist Mark Straka, demonstrating tile production with Ceramics Director Bill Young. Guests appreciated music by Last Call Trio. Light refreshments were enjoyed near the painting studio thanks to local contributors at Miller's SuperValu, Schild's IGA, and John Seiling Catering. Becky's Bundts cakes and Sheris Coffee were enjoyed in the clay studio while Bob Cox and Friends entertained. AOS artist Debbie Deitrich demonstrated as local visiting artist and volunteer Barb Schnellinger stitched handmade books. Great conversations with friends and AOS artists Shea Collins and Albert Greenlief. A view of our painting studio housed at HCBDD. AOS artist James O'Dor demonstrated his unique mosaics during the event. James O'dor in his element. Community members and AOS artists had the opportunity to mingle and chat. A view of the ceramics studio and a selection of tile products on display. Exploring and chatting in the clay studio. Beautiful table decorations by Danielion Ideals that Bloom. Great conversations, Sheri's Coffee, and Becky's Bundts. The highlight of the night involved AOS board members Jan Tkach and Jennie Hipp taking the time to recognize newly retired Managing Director and Founder of AOS, Lynda Stoneham. Jan explained the history of a dream turned reality, as AOS was carefully and strategically formed by Lynda's dedication and passion in 2004. Her husband, Dennis Stoneham, took part in this dream and supported the efforts as he volunteered his time as treasurer/accounts manager since the beginning. Many well deserved kind words were offered to Lynda for her selfless devotion to the building and success of Artists' Open Studio. Left to right; Jan Tkach (Vice President), Jennie Hipp (President), Dennis Stoneham, Lynda Stoneham. Thank you to the local businesses and donors/contributors who made this event possible. AOS looks forward to events like this in the future! JULEE GROSS began coming to AOS Painting Studio meetings last year bringing her pleasant personality and curiosity for making art. Since then she has been experimenting with different media to develop her drawing and painting style. We have learned that Julee paints narratively; each creation telling a personal story. 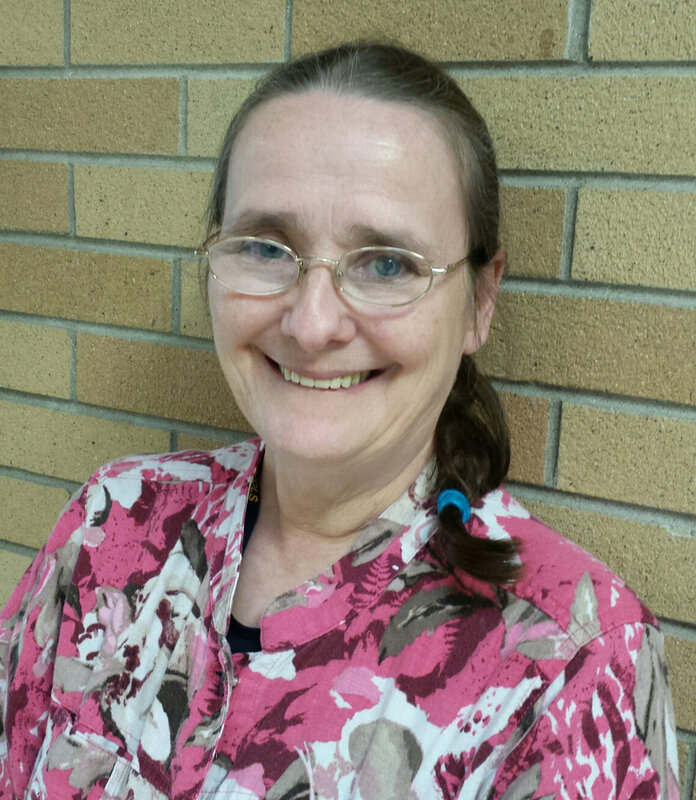 Julee works as a receptionist at Christie Lane School and enjoys attending sports events. 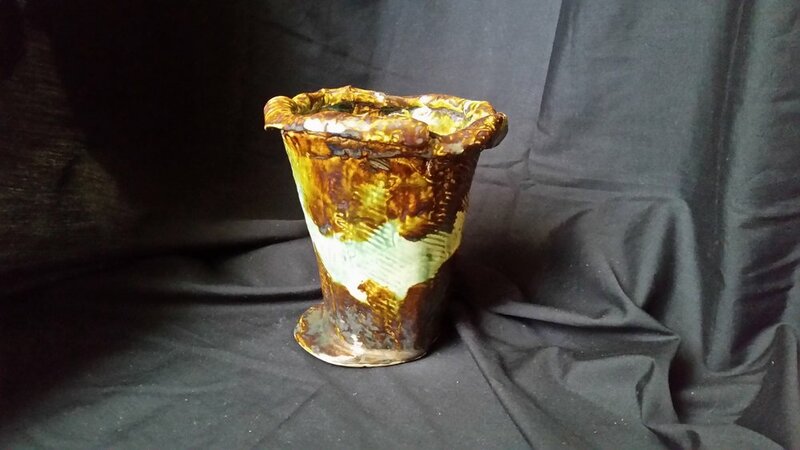 JENI GREMMER waited several months for a chance to participate in AOS Ceramic studio. She enjoys the social time while making her colorful art pieces. Jeni has created some very unique and lovely items, like her mobile /wind chimes. 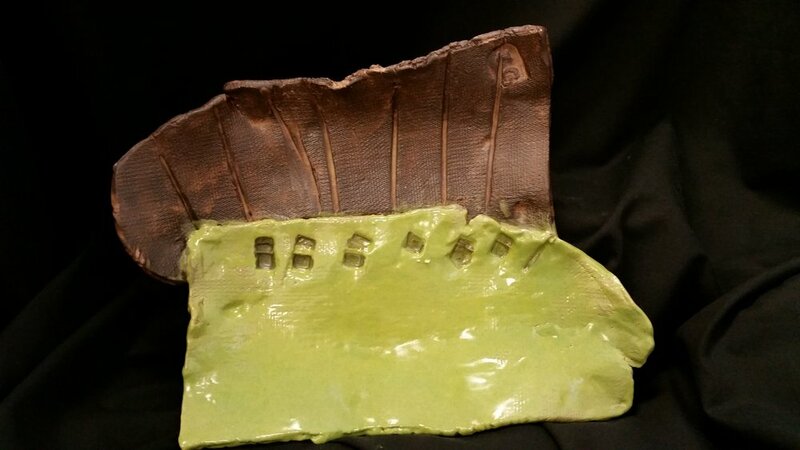 Only two of her ceramic art pieces are available. Jeni has given most of her work to some very lucky friends and family. Our artist of the month for the month of June is Ben Vanderpool. Ben came to AOS in 2017 with a unique interest in textiles and fabric. Ben quickly fit into the AOS family with his quirky sense of humor and innovative style. Ben is drawn to fabrics for their textures and patterns and is gifted at pulling the right color schemes together. In studio last year, Ben crafted a hand sewn bag based on a scene in Harry Potter. 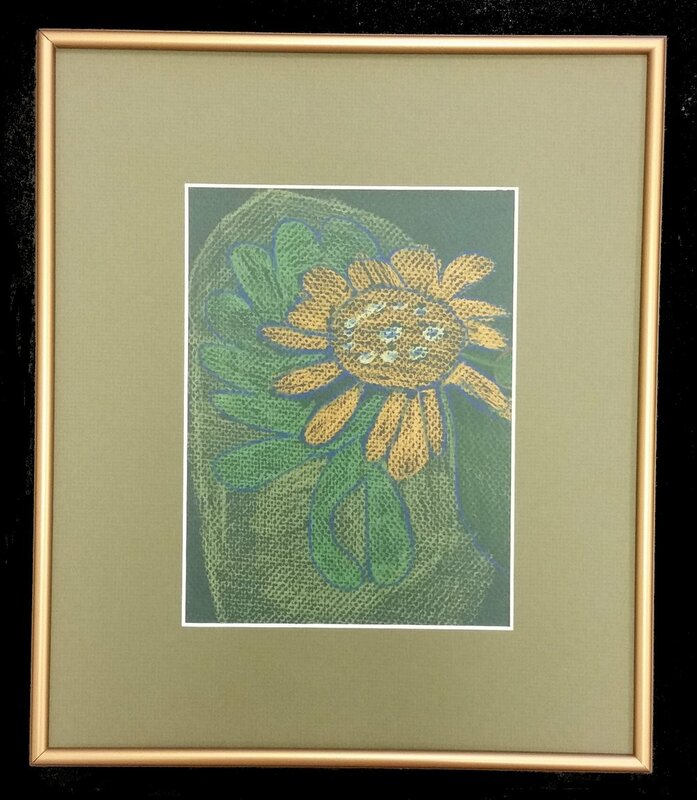 During his 2018 year, Ben ditched the sewing machine and began making unique artwork integrating drawing on fibers, as well as mixed media designs on painted canvas. We know Ben will continue to inspire us with his unique tastes and aspirations to create mixed media art with textiles! SARAH VANDERPOOL waits anxiously for her sessions at AOS Ceramic studio. She has been coming for two years now. 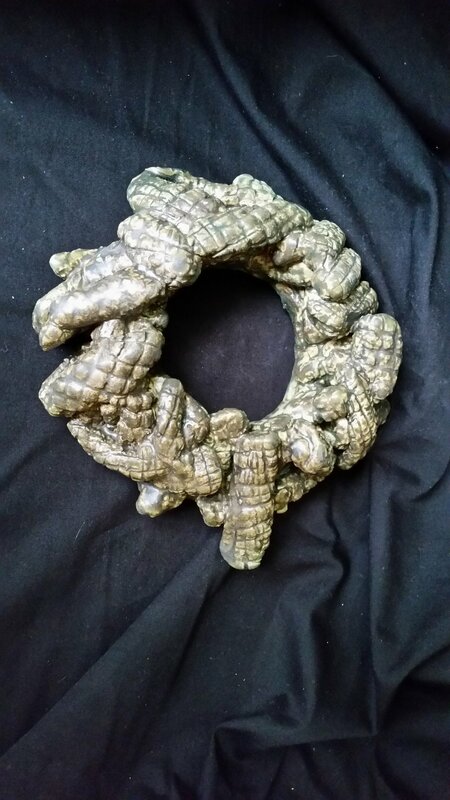 While she has had fun discovering her skills, Sarah has made some very unique art pottery and sculptural pieces. We look forward to showing off Sarah’s newest work and that of our other artists at the Visions Revealed 2018 Exhibit. Mark your calendar for June 15th, 4:00 – 7:00 for the opening reception at the Ernsthausen Performing Arts Center Gallery, Norwalk. 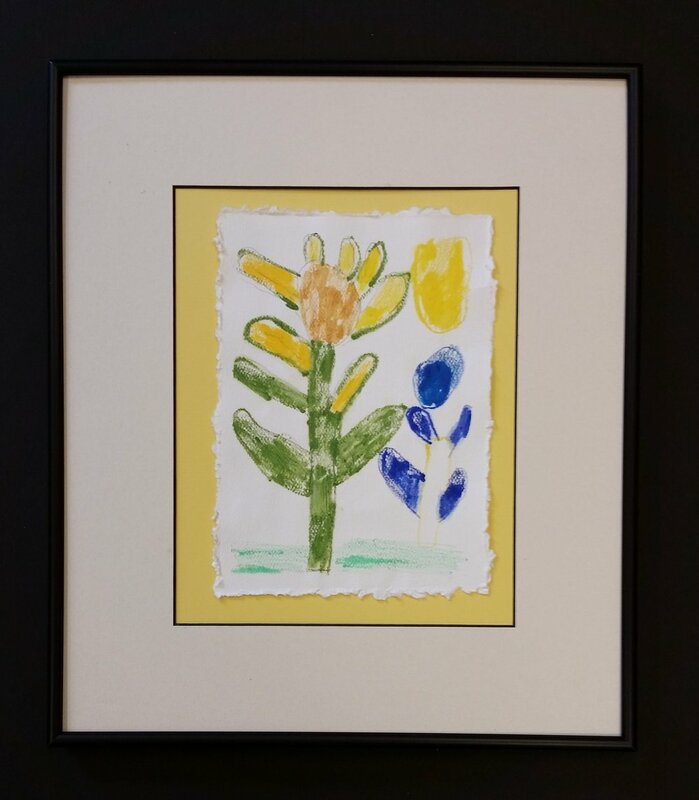 This month we celebrate the art and achievements of Nathan Lucal, artist and advocate for interests of people with developmental disabilities. Nate not only speaks his mind vocally, but he expresses himself with his painting skills. He paints in oils at AOS and at home, most often choosing landscapes or architectural themes. Nate makes the most of every movement possible to create art and a life style that defies limitations. Congratulations Nate for being one of the four AOS artists represented in the VSA 2018 Exhibit and Ohio Tour! Check our Nathan's Artist Gallery page on this website. Tony and Jesse getting the thumbs up from VSA Executive Directory, Erin Hoppe. 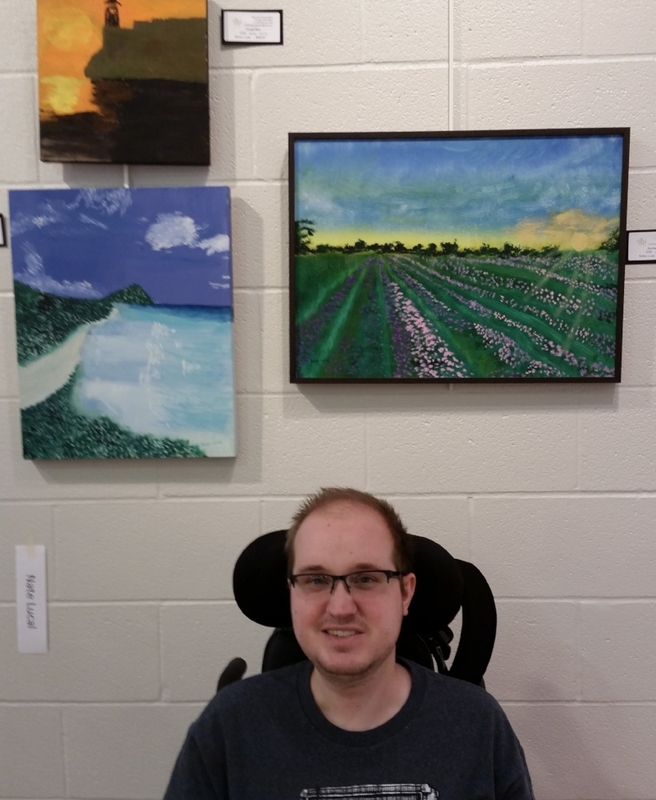 What an exciting day it was on Saturday at the VSA Accessible Expressions Art Show. AOS artists Tony Ringholz and Jesse Fields were there to be recognized as two of the 75 outstanding artists whose work will be featured in the year-long tour around the state. Works by Nathan Lucal and James O'Dor are a part of this exhibit also. Congratulations to all of you! 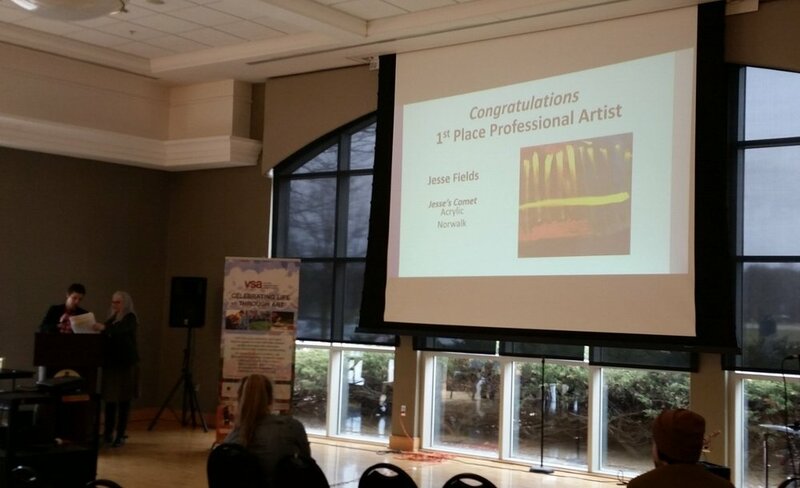 To make the day even more exciting Jesse's painting entitled "Jesse's Comet" was awarded First Place in the Professional Artist category!!! What a great accomplishment Jesse, to catch the eye of the team of jurors who selected your work!! BARB SEEVERS draws exclusively and masterfully with colored pencil. Her colors are clean and bold to enhance her small abstracted motifs. Barb is always ready to turn on a smile as she works quietly in AOS Painting Studio, filling her portfolio with beautiful drawings of natural forms each day. Our studios are back up and running for the 2018 year. Yes, we are blissfully busy creating again! But, we don't want our fans to miss out on the most recent artwork produced from our talented artists. Our Artist Gallery has recently been refreshed and updated to reflect our newest pieces that are for sale! Below are a few teasers, but take a moment to browse our galleries and discover what's new in our world! Your next chance to see the newest artwork is during our annual Visions Revealed art exhibit at the Norwalk High School in June. If you would like to keep up with our studio happenings make sure to follow us on instagram and check our facebook page! BRENDA MACKEY is a very self-determined person. She has a passion for making hand built ceramics and finds it difficult to stop once she gets started. Her work is carefully formed, often enhanced with appliques of clay and incised detail; then, is meticulously glazed. Brenda has been making art with AOS since 2013. By tradition our studios are on R&R during the December holidays and for much of January. It is a time to Refresh and Redirect our strategies for the new year. While the artists are enjoying their snow days, the AOS Staff is busy sorting and framing art and getting ready for shows that are coming up this spring. The first show on our calendar is the VSA /Accessible Expressions 2018 Exhibit which opens on March 24th in Westerville. Art accepted for this show was make by: Jesse Fields, Nate Lucal, James O’Dor and Tony Ringholz. It’s a “big deal” to have work chosen for this state-wide competitive exhibit. Congratulations guys! We know that all of the artists are anxious to get back to their clay and easels. The winter studio groups will begin on January 23rd and 25th. There is more great art to be created! 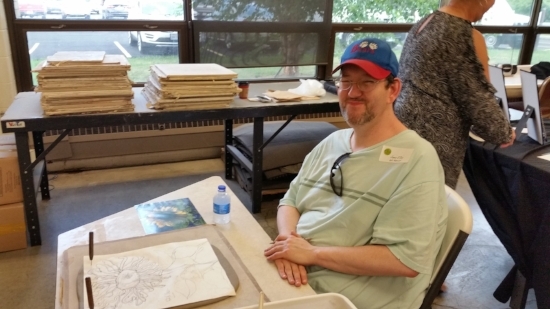 DENNY RANDLEMAN is such a great guy and we love having this quiet gentleman in our Ceramic Studio. He comes to AOS with a smile after a long day at his job; makes some great clay projects with his friends; then, leaves with a smile promising to return next week. Denny has been exploring techniques for functional ceramic pieces with an artful flare. Contact us if you wish to purchase his unique art for your home. MARK HOFFMAN started coming to AOS Painting Studio early this year with great enthusiasm. Even when he has had a rough morning at work, Mark is anxious to spend some quiet time drawing with his friends in the afternoon. Architectural subjects have been his major interest thus far. Some of his structures are representational with much detail while others are freely interpreted designs. Whatever Mark has drawn, he is proud to share with his fellow artists and staff at work. We look forward to Mark’s next exciting works. Thanks for Blogging Along with AOS! In January of 2014, AOS launched this beautiful website with the professional skills of Jamie at JaC Design. We hope you are enjoying it with each visit. There is so much to see and learn about Artists’ Open Studio on our Main page. Be sure to scroll to the bottom right to catch a glimpse of AOS in Action which features frequent posts from Instagram. On Our Story page you can read about how AOS came to be, about our collaborations and how we support the creative spirits of artists of all abilities. Take time to browse through the Artist Gallery to view original works. Then, check out our line of handcrafted art tile and coasters in our Shop. You will find that it is easy to purchase art and products through our secure website. A great way to keep in touch with AOS is to follow us on Facebook. A quick click on our web link in a FB post will bring you right here to our Blog page where you can review announcements about our products, events and the Artist of the Month. Be sure to add a comment and share our FB posts. 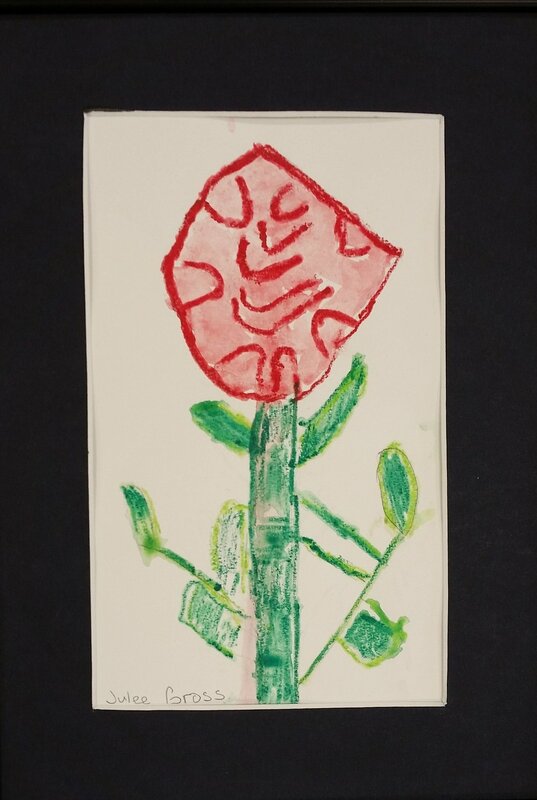 Then, if you’ve been inspired by our passion to make the fine arts accessible to individuals with developmental disabilities, please click on DONATE in the menu above. It is safe and easy to make a contribution to “Help AOS to Grow”. Thank you! It's that time of year again in North Central Ohio. Labor Day Weekend is on the horizon, and locals look forward to the wonderful festival that is quickly approaching. That's right, the Milan Melon Festival! It'll be here before you know it, and AOS is participating in the fun this year. Our tile production team has been busy collaborating with a new business "On the Square" in Milan. CrossTown Goods opened on May 15, 2017 and is located on 12 N. Main street in Milan. Their shop features handcrafted, high quality artisan items for your home. This business has passionately supported our mission by displaying AOS artwork in their store. Recently, a new tile design, inspired by the Milan Melon Festival was created! A beautiful soft orange glaze and brown glass melted into the melon design. For those who are not familiar with our products, the process of making tiles is a collaborative effort between staff and our tile makers. AOS designed tools and techniques are used so that individuals with developmental disabilities can make these unique art tiles. Our tile maker for this project was Albert Greenlief. Albert is an artist who participates in our ceramics and drawing/painting studios. He is also a hard worker and was up for the task! From start to finish, these tile coasters were created to celebrate the Milan Melon Festival! We are proud to reveal this design, and encourage you to go see them at CrossTown Goods in Milan during the festival. You won't be able to find this unique handmade tile anywhere else! TERRY WALKDEN has found art making to be a great pleasure and participates in both AOS Painting and Ceramic studios. He pays close attention to detail in all that he creates. Terry’s curiosity has led him to some unique experiments this year. In painting studio he made a composition of fabric applique by drawing with colored pencils, then hand-stitching to complete his design. 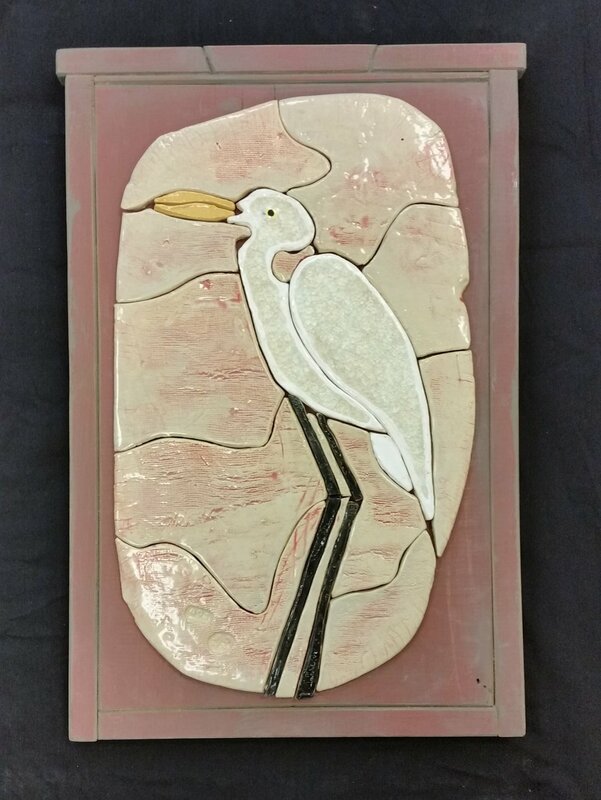 In ceramic studio he carved a bas-relief plaque with a bird. Unfortunately, the large tile cracked in the firing, but with a supportive wooden mount the finished art is even more exceptional. Terry is a hard worker and often assists in AOS tile production. 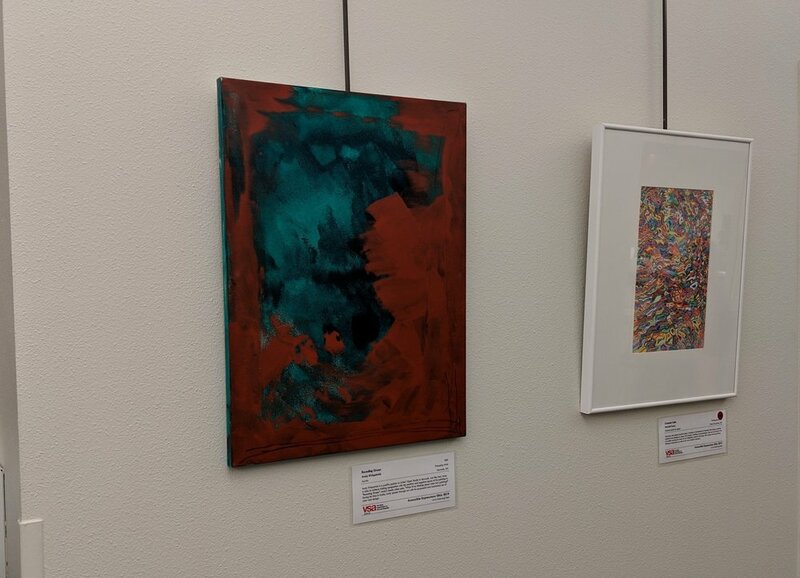 THIS IS THE FINAL WEEK for you to view the fantastic art in the Visions Revealed Exhibit which features artists from Cleveland Clinic Cancer Centers, Gaymont Nursing Center, Artists Open Studio along with other local artists. Come to the Ernsthausen Performing Arts Center Gallery, Norwalk High School, 350 Shady Lane Drive, Norwalk, Ohio. Gallery hours: Tuesdays and Thursdays 9:00 - 12:00. Our closing reception is on Friday, July 21 from 5:00 - 8:00 pm. which will include art from Fisher-Titus Autism Spectrum Kids. One of the unique aspects of this show is the diversity of art and artists who participate. Because of our collaboration of studios, you will see drawings, paintings, fiber arts, assemblages, ceramics and sculpture by artists from all abilities and all walks of life. They are beginning, discovering, emerging and professional artists with great passion for expressing their deepest thoughts. A recent artist visitor said, "This is the best show I have seen all year. I have been to several exhibits of beautiful art, but this show is different. These artists speak plainly from their hearts." 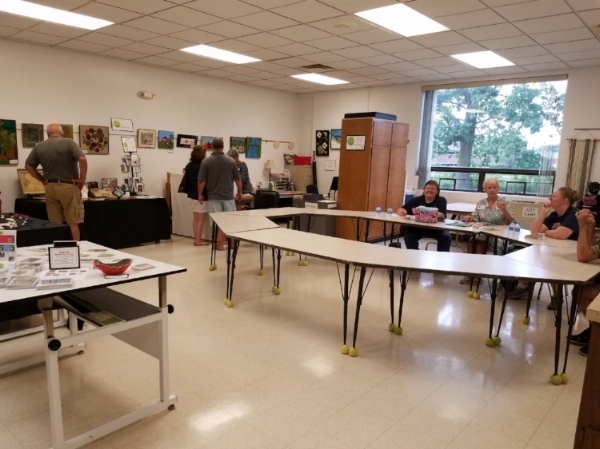 Note everyone of the artists who make their masterpieces at Artists' Open Studio were at the June 16th opening reception of Visions Revealed 2017 exhibit. But, here is a photo that you might enjoy. If you missed the occasion, there are more opportunities to see the display at the Ernsthausen Performing Arts Center Gallery. It is at Norwalk High School, 350 Shady Lane Drive, Norwalk, Ohio. Gallery hours: Tuesdays and Thursdays 9:00 - 12:00. To end it all with a bang, come to our closing reception on Friday, July 21 from 5:00 - 8:00 pm.